In order to detect cases of disproportionate assets owned by a taxpayers as compared to his known sources of income, the income tax department wants taxpayer with income over 50 lakhs to report various assets and liabilities in ITR. The requirement was implemented in 2016 and has since been modified from time to time. Let us discuss the latest requirements in detail. To whom this requirement is applicable : It is not that each and every taxpayer has to report details of his assets and liabilities. 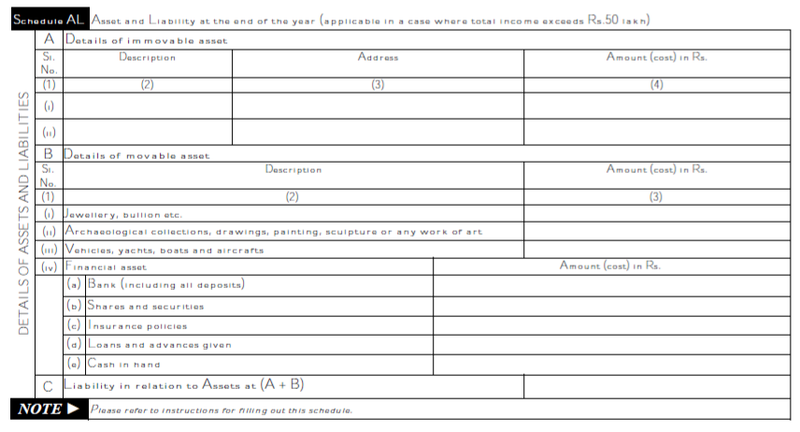 The requirement to report the assets and liabilities is only applicable in case your taxable income exceeds Rs. 50 lakhs for the year. So the people who are eligible to file the ITR 1 (Sahaj) do not have to furnish these details. Moreover in case you are engaged in a business and thus furnishing your balance sheet in the ITR, you are required to furnish only the details of the assets which are not already disclosed in the balance sheet. 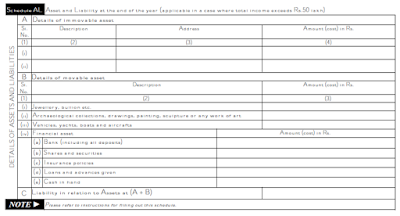 What assets are required to be reported: The format of disclosure of assets and liabilities is the same for all the ITR except that form ITR 3 and 4 you are required to submit the details of interest in the firm where you are a partner. You are required to furnish the details of your assets and liabilities as on 31st March 2018 under the AL schedule. So any asset disposed off during the year will not form part of the schedule. Disclosure for immovable properties: You have to disclose the details of immovable properties i.e. land and building owned by you in schedule AL While submitting the details of immovable properties, you have to mention the description, cost and address of the property. Please note that it is not that you have to disclose the assets which are purchased by your own fund but you also have to disclose the details of any immovable asset received as gift or inherited by you. So in case you own any house in your ancestral village which is inherited by you, you have to furnish the details here. Even if you are a joint owner of a property, you still have to furnish the details such in cases where you have inherited a house jointly with your relatives or bought any property jointly. While disclosing the cost in such cases you may face some problems as you may not have the details of cost for which the person, from whom you had inherited or received the same as gift, had purchased it for . In such a case, in order to comply with the requirement and as a safe measure you can indicate the market value as on 1st April 2001, as this is acceptable as cost for the capital gains calculation purposes. In case any money is borrowed for the immovable property or is borrowed on security of the asset, the same also needs to be disclosed in the schedule. Disclosure of movable assets: Under the movable properties the assets to be disclosed include financial assets like cash in hand, bank balances, shares and securities, loans and advances, and other movable asset like jewellery, bullion, vehicles, yachts, boats and aircraft, work of art etc. as on 31st March 2018. Under the category of jewellery it is not only that you are required to disclose the details of jewellery but also the bullion held in raw form so in case you own any gold bar or coins, the cost of the same needs to be disclosed in the schedule. In case of assets inherited the same principle as discussed above should be used. While disclosing the details of bank balances it is not that you have to disclose the details of only saving, current account, recurring and fixed deposits but also the details of your loan account in case the same has positive balance. In case of shares and securities in cases where you have received these by way of gift or as inheritance and you do not know the cost, the market price as on 1st April 2001 may be furnished as a safeguard. The traditional Insurance policies may be treated as investments but the term insurance plans, where you do not get any money back if you survive the policy term, can not be treated as investment. However since no distinction is made between the traditional policies and term plans, I would advise you to include the premiums paid till date on term plans as well under the head insurance polices. You are also required to disclose the details of your vehicles, yatch, boats, aircraft etc, so the vehicles which are not used and are not yet discarded or are being maintained as antique piece are also need to be disclosed.